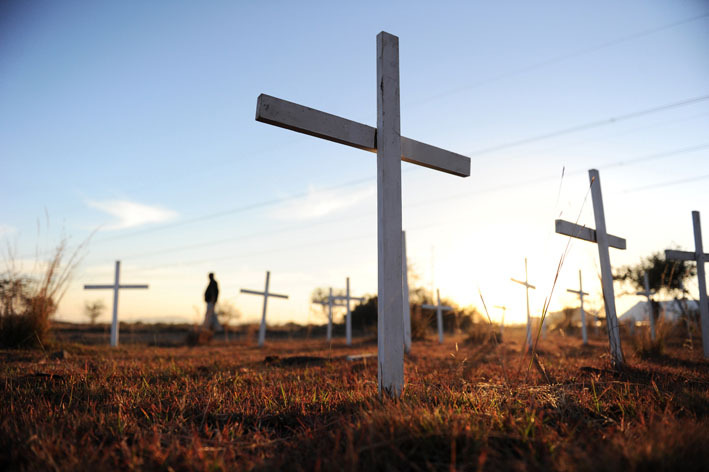 FILE PICTURE: Anniversary of the "Marikana Masacre". Picture: Michel Bega. Platinum miner Lonmin was behind in paying salary increases for rock drill operators when approached by workers in June 2012, the Farlam Commission of Inquiry heard on Tuesday. “At the time, I saw what had happened at Impala [Platinum]. They had given an increase to rock drill operators,” Michael Gomes da Costa, vice president of Lonmin’s Karee mining operations, told the inquiry in Pretoria. He said he knew Impala Platinum had increased its rock drillers’ salaries before Lonmin’s miners approached him for a meeting. About 300 miners approached Da Costa on June 21, 2012. He asked to speak with two representatives from the group. They told him they wanted a basic salary of R12,500 for Karee’s rock drill operators. “I pointed out that the increase is extremely high and unaffordable. They thought it was the number that would reward them for the work they do. They said it was a good number,” Da Costa said. He told the miners there were structures to deal with wage increases. They responded that they did not want the unions to be involved. The miners told Da Costa their work was physically demanding and the hours were long. Da Costa said he told the miners he would refer the matter to Lonmin’s executive committee. He said the meeting was cordial and the miners were respectful. Karee’s acting human resources manager July Tiro accompanied Da Costa to the meeting. The commission, chaired by retired Judge Ian Farlam, is investigating the deaths of 44 people during the violent wage-related strike at Lonmin’s platinum mining operations in Marikana, North West. On August 16, 2012, 34 people, mostly mineworkers, were shot dead by police while trying to disarm and disperse them. Another 10 people, including two policemen and two security guards, were killed during the preceding week.